Learn how you can maximize your DIY remodeling budget by shopping for bargains online. Everyone is doing it—internet shopping. In fact, this year 148 million U.S. consumers age 14 and older will make at least one purchase online, according to estimates reported by eMarketer. By 2015, that number could grow by an additional 30 million consumers. And it’s not just the convenience of shopping online that keeps customers coming back for more. It’s the variety and the bargains. You can find deals for just about everything online today, from clothing and electronics to groceries and travel. Home goods and DIY/remodeling products are no exception. Think faucets, hardware, appliances, lighting, windows and tools. Imagine buying a Kohler jetted tub at 2 a.m. in the comfort of your own home at a store that never closes, where there’s never a line at checkout. And, while sales are common enough in retail stores, you may find even greater savings by searching the sites. With no brick and mortar stores to maintain, online retailers are in a much better position to pass savings on to their customers. The key is to do your research and invest some quality shopping time. Whether you live in an area where retail shopping is plentiful or limited to a big box store, a small hardware shop, or perhaps a manufacturer showroom, the key to finding deals is shopping comparatively. Online you have access to the broadest range of products possible. Having more to choose from could seem more of a curse than a blessing. But, rather than become overwhelmed, spend time researching and comparing brands and features, and the list will begin to winnow down based on your requirements, personal likes and budget. To help you navigate products, features, and costs more competently, look to comparison shopping sites like mysimon.com, pricewatcher.com, and dealzconnection.com. You can search these sites by product category and then compare by brand. When you know the brand and model, be sure to check out the manufacturer’s website. Many sites, like boche-home.com, will let you select multiple products in the same category to see how they stack up in terms of features and cost. If budget rather than brand is your guide, then you’ll find even greater values online. With promotional coupons and incentives from retailers, manufacturers, newsletter promotions, and websites like Groupon, your purchase can be a real bargain. And, don’t overlook Amazon, O.com (formerly overstock.com), eBay and Craigslist.org where unsold inventory of home goods and DIY-remodeling products can be found at significant savings. Before you get carried away filling your “shopping cart” with purchases, consider some of the disadvantages of buying online. The most obvious one is that you can’t physically check out the merchandise. How does the hardware handle or knob feel in your hand? What is the outward swing of the refrigerator door? How different does a satin finish look from a brushed finish? Does the countertop material feel warm or cool to the touch? And what about the true color of those cabinets? It’s always best to see any product before you commit to buying it. The savings will not be as valuable if the product you choose is not what you expected. Another concern is whether the online merchant is legitimate and a safe place to shop. Look at what other shoppers have to say about their online experiences at sites like Bizrate.com and epinions.com. You can also check out the Better Business Bureau online if you have additional concerns. Look for signs that the website protects your data. Encryption is a security measure that scrambles your personal information as it gets transmitted. If you see “https://” in the browser web address, you should feel confident that the site is credit-card safe. Likewise, using PayPal is a secure way to make payments on the web that is linked to many popular online shopping destinations. Before you make a purchase, be sure to read the fine print—all of it. While shipping costs may be waived as an incentive at time of sale, some sites can make it very difficult to return merchandise. Many will not pay for the return-shipping charges; some will only do so if the item is being exchanged. You might also be charged a restocking fee for any merchandise returned. If you are paying shipping fees, take that into account in determining the value of buying online or buying in-store. Sometimes paying shipping charges for small items—like a light dimmer—may be more than the item itself or the potential savings. Just as retail merchants rely on point-of-purchase sales, online retailers are hoping for the same impulse buy. The array of products that are likely to turn up in the DIY remodeling category on your home computer screen will certainly be seductive. Do not rush to buy because you see a great deal. Also be sure you know what companion products may be required (a pressure valve or right-angle arm for a shower head) or the right specifications (a faucet that is center-set rather than wide-spread) for whatever you buy. Still wondering what type of savings you can expect by shopping DIY online? Check out this Buying a Faucet case study. It was easy on one hand but not on the other. Be sure you have the model number from the manufacturer as well as the correct name and details, including the finish color and a picture. Why a picture? Because some online retailers change the model name when they offer it at a lower price than the manufacturer. I selected a Margaux Faucet from Kohler because of its WaterSense® properties, simple design lines (translation—easy cleaning), and its two-handle widespread specifications. I knew it was a faucet that would work well with the existing Kohler plumbing I currently have in the bathroom. First, I went to my nearby Home Depot store to check the price: $483 plus sales tax; already a considerable savings from the manufacturer’s list price of $682.35. That would serve as my base price for future shopping. 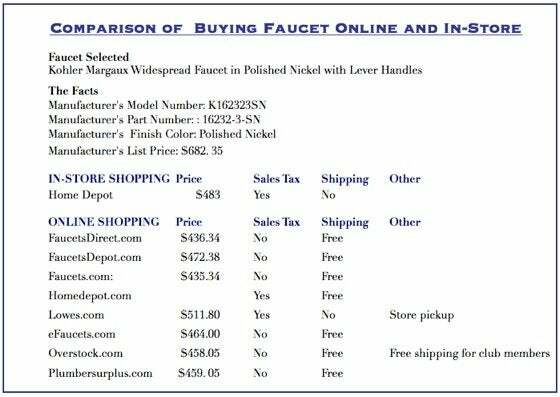 Back at my computer, I discovered that homedepot.com was having a sale on that very faucet for $399 (almost $100 less than the retail store) with sales tax required, but no shipping fees. It was time to visit the online shopping destinations for more comparisons. Here’s what I was able to find. The winner—homedepot.com with best price and free shipping, even if I did have to pay sales tax.